Spring (or is it summer?) seems to have finally arrived and with the promise of Spring, usually brings the promise of Tench. 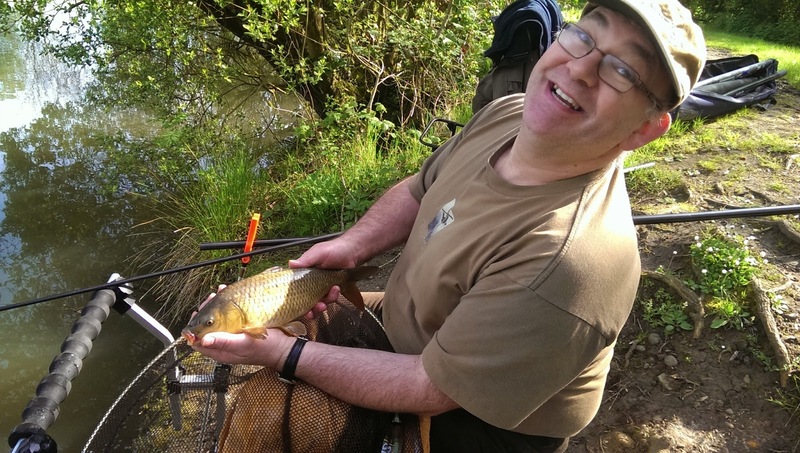 I had already caught a couple on a recent trip to the Viaduct, so I knew they were feeding, but it was now time for me to try and help my father in law Jeff catch his first ever Tench. Duffryn Springs Reservoir lake in South Wales is where we would be heading. This venue had produced plenty of Tench for me, so here’s hoping it would stand up to my assurances and do the same for Jeff. I had a very specific peg in mind, and because I knew it as a “flyer”, we set off early to make sure we got to the peg first. After paying, driving down to the second car park and heaving our gear down to the lake by 8.30am, we were both surprised to see that we weren’t the first people at the lake. 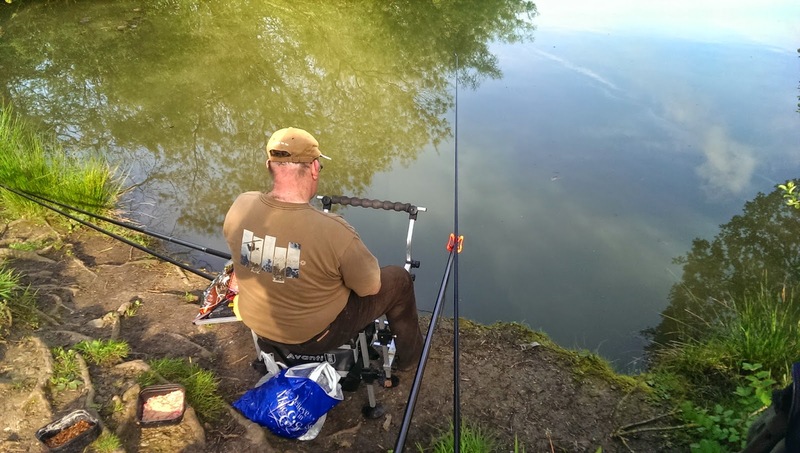 Happily enough though, my chosen peg was free, so I showed Jeff where to fish and decided to fish the open water peg to his right. With Jeff on the corner peg, I would be fishing open water. Although I did have a small margin swim at 6 meters to my left and the right hand banking at 11.5/13 meters. Plumbing up, the depth of my peg was anything but uniform. The margin swim to my left was 3 ft, the open water swim varied between 4½ – 6 ft and the far right hand bank came in at just under 18 inches. I also decided to set up the waggler rod, and would primarily be using this to fish the open water. True waggler fishing in some respects is (sadly) almost a forgotten form of fishing on many waters these days. It has either been adapted with shorter, stiffer rods (for pellet waggler), or been replaced entirely with an array of poles which are able to do the job as well as any waggler. Whith the ongoing development of Poles and elastication systems (pulla bung, side pullas and the new rolla pullas), people are now catching more fish than even on the pole, allowing the once favoured match rods to gather more and more dust. Today I would be fishing at around 20 meters, and after a quick look at the water, I chose to fish an “on the drop” shotting pattern, with the bulk of the shot around the float base. I threw a few handfuls of pellets into the margin swims, priming them for an hour or so on the pole later on in the session. Hooking double maggot I cast out and waited for the float to settle. The insert waggler I was using barely cocked before it slipped under. 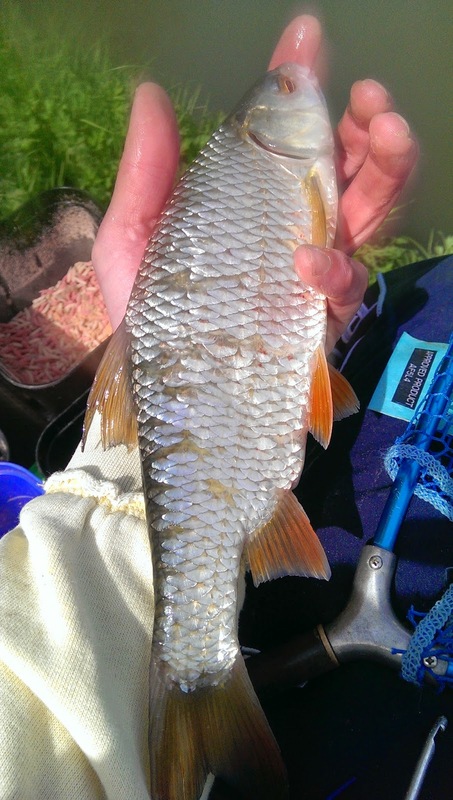 A roach started the session, and it was clear the fish were on the feed up in the water. Jeff seemed happy with his carp! I wound in and nipped over to his peg. Fishing corn close to the lilies, Jeff had managed to pick up something a bit more sizable. Inwardly I was praying for a Tench, but when the fish broke the surface and swam into the net it was a Mirror Carp of a couple of pounds. Inside I was cursing it, but Jeff seemed happy with the fish. I returned to my peg and decided to give the left hand margin a try. Banding on a 6mm pellet I shipped out and patiently waited. The line bites were instant but the fish came a few minutes later. 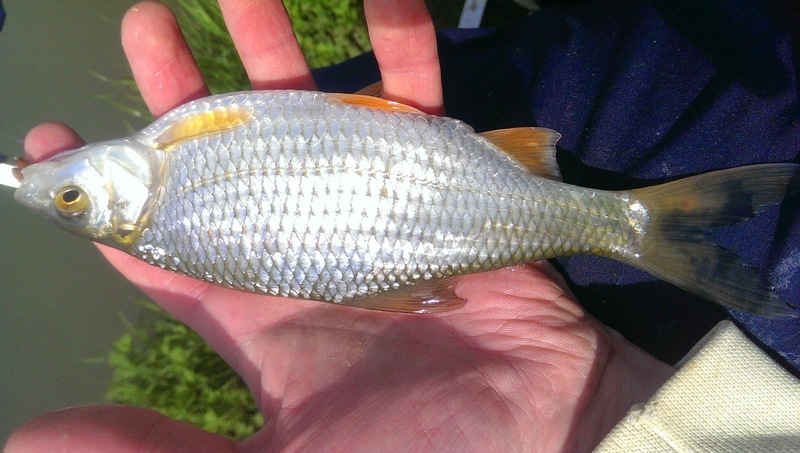 A nice Roach, and this fish had definitely seen some battles. This was the only fish I caught from the one margin, and after 15 minutes I switched to 8mm hair rigged halibut pellet and shipped out to 11.5 meters, aiming to fish the right hand margin, next to an overhanging bush. Despite a few line bites and 3 pellet changes I had no joy, and swapped back to fishing the waggler. The silver fish were still feeding in force and a few hours of solid waggler fishing meant I had a good bag of silver fish. 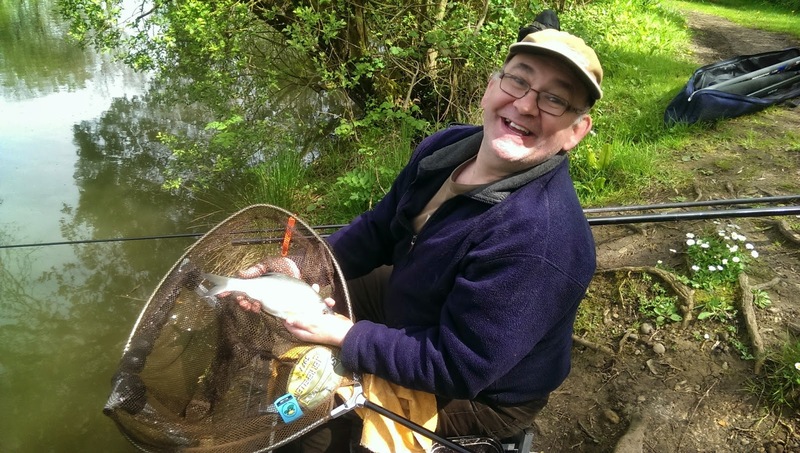 Jeff was also catching a steady stream of silver fish, and was busy catching Roach and Skimmers (but still no Tench). Fortunately I had a second rig which was exactly the same (I generally make my rigs in 3’s), and re-banded the bait for a third and final time. Shipping out, I placed the bait as close to the reeds as I could, the bite was immediate and with more luck than judgement I managed to heave the fish towards me. After a relatively short fight the fish swam straight into the net at full speed. I whispered “Thanks!”, as I pulled this very lively Carp out of the lake and onto the unhooking mat. A great fish just under 10lb, I contemplated shipping out one more time, but nearly caught a tree, so decided this was a sign to stop before more than a hooklength snapped. Jeff sadly never caught the Tench that I pretty much promised him (so I left feeling slightly disappointed). We will probably be returning later in the year to give it one final go, before I look for venues in my neck of the woods. 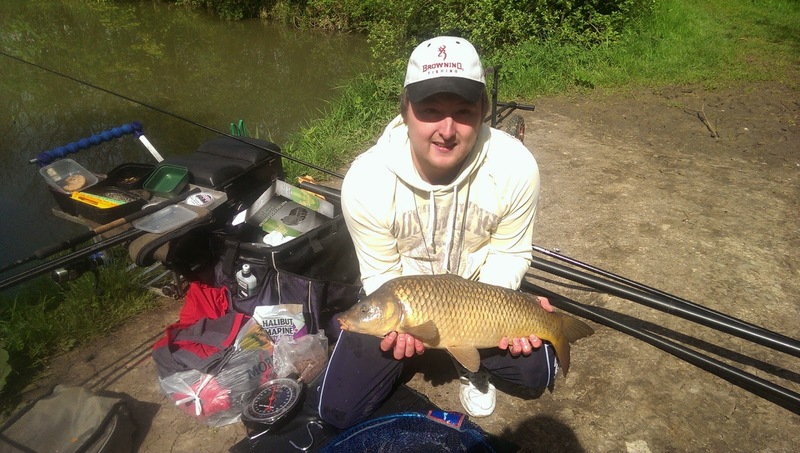 He seemed happy with his catch however and managed a solid species count of Roach, Rudd, Perch, Bream and Carp. Everyone else on the lake also seemed to have caught well, and I watched several anglers land quality slabs (big Bream) and several nice Carp. 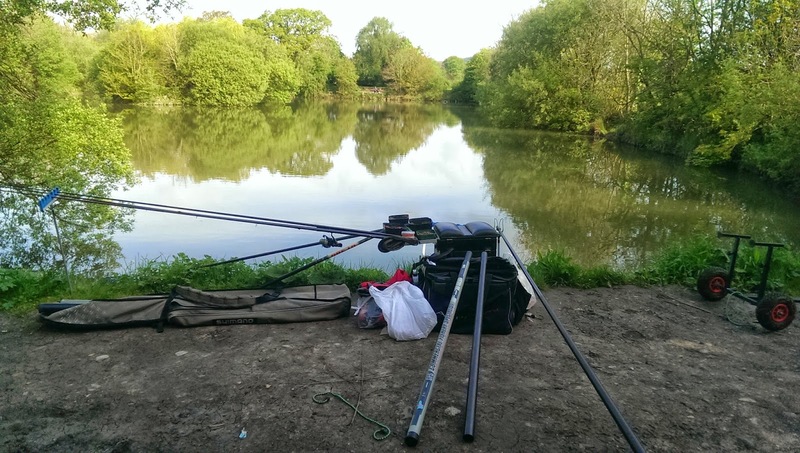 Duffryn Springs has a lot to offer to every level of angler and I would wholly recommend a session (or two, or three) there.